Have you heard of Sold.sg? 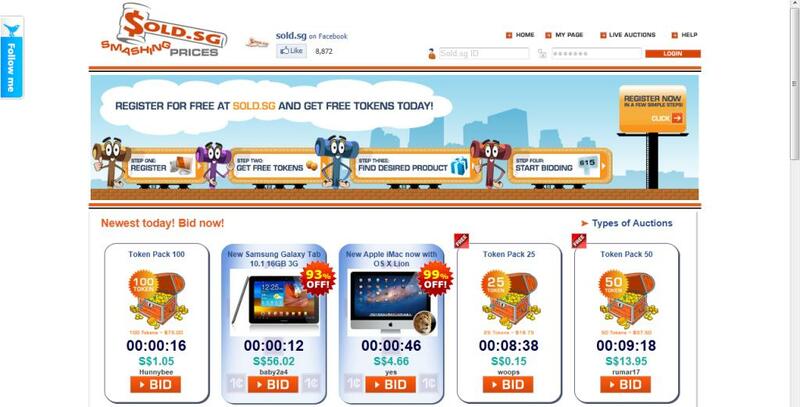 Launched in July 2010, Sold.sg is an auction site where users use tokens to bid for brand new items starting at $0.00, offering huge discounts. 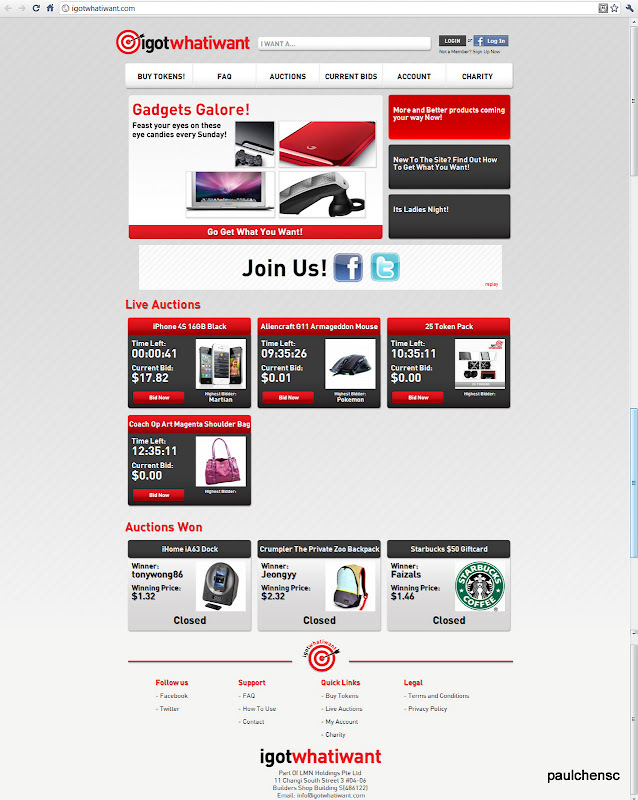 The items are sourced by the company and put up for bidding on the site. 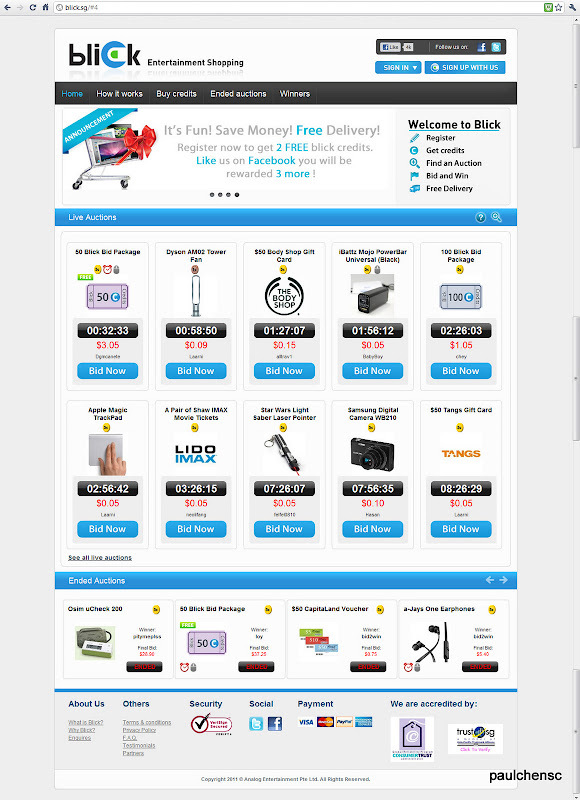 This fun and entertaining website was launched in July 2010. It's free registration! Registration is just a few simple steps. 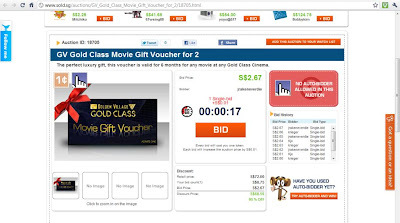 After clicking on the email confirmation, you are now a registered user of Sold.sg! After registration, you will be given 10 complimentary tokens as "New Member Bonus Tokens". So I went to their main page and look for items to bid. There are a wide range of items to choose from. 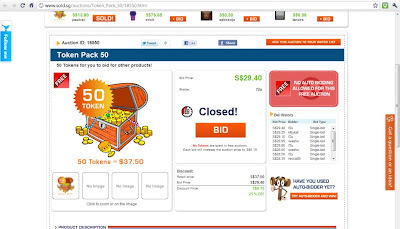 Each time you press the 'BID' button, you used up 1 token, the price of the product increases and the time remaining on the clock will also increase. It's so easy to use! 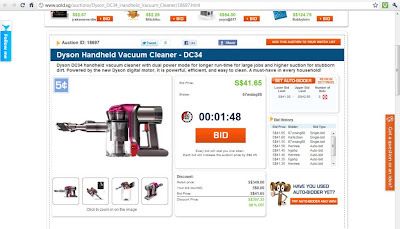 And when you are not fast and decisive enough, the item that you wanted to bid will be gone! 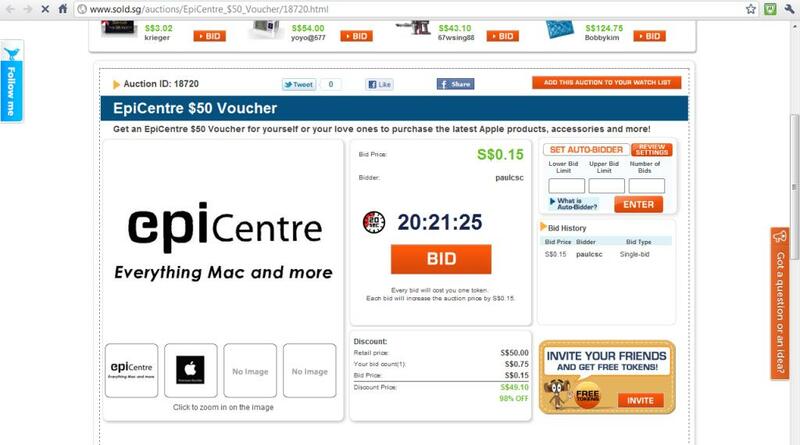 Once the timer goes to 0 seconds, the last bidder wins the auction. Be familiar with all the different kind icons and what they mean - http://www.sold.sg/guide/about_auction_type. The bidding was a fun and exciting process. It really gets your heart pumping, especially with the "Auction Ending Soon" flashing together with the countdown timer. Even just watching other people auctioning gets one excited! "Upon confirmation of a successful auction, you have 14 days to make payment. The item will be shipped out upon receipt of payment." I've made my payment, and now waiting for the item to be delivered to me... It's free delivery (within Singapore)! "The product will be delivered to your registered address within 14 days (upon confirmation of payment)." The "Auto-bidder" function takes me a while for me to fully understand how it works. 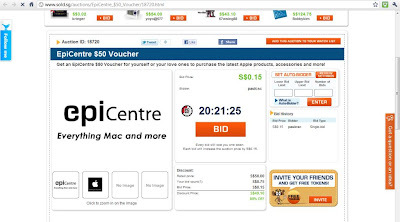 Read up before you use the function - http://www.sold.sg/guide/about_auto_bidder. You cannot bid for the same item you have won in the last 28 days. Each bidder is only allowed to win a maximum of 8 auctions (of all types available on the site) in 28 days. 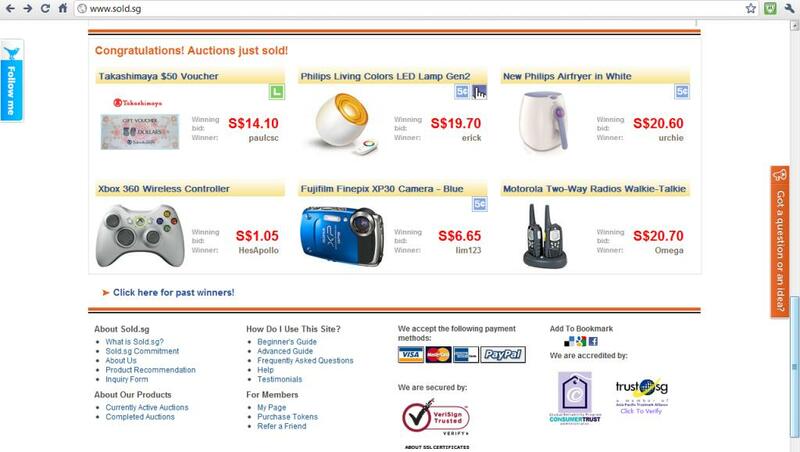 Beginner Auctions are meant for users whom have never won any auctions on our site. Once you have won an auction, regardless of type (Normal, Free, Manual and etc), you will no longer be eligible to participate in Beginner Auctions. - (hint!) So start with Beginner Auctions, there's lesser competition from those veterans bidders! Each bid requires one “Token” (S$0.75). Tokens can be purchased from "My Page". Little known fact: You get 1 free token for each day you logged into the site - "Login Bonus Tokens". Free Tokens expire in 7 days. 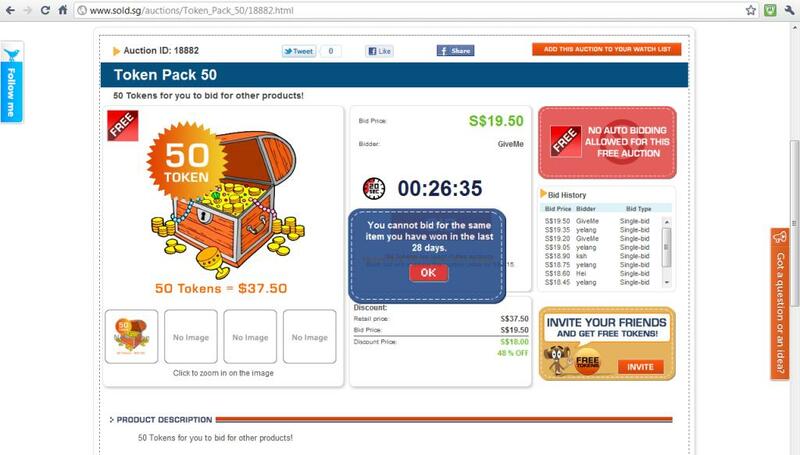 Purchased Tokens will expire in 180 days from the date of purchase. All Token Packs and Token Auctions are inclusive of GST. Final Bid Prices of Auctions are exclusive of GST. If you have any product recommendations that you would like to see on their site, you can suggest it to them through - http://feedback.sold.sg/forums/73105-product-recommendations. Try it! Who knows, you might win the next auction. I foresee that this will be the next big thing after those Daily Deals sites. I guess there will be some kind of mobile application for this soon! 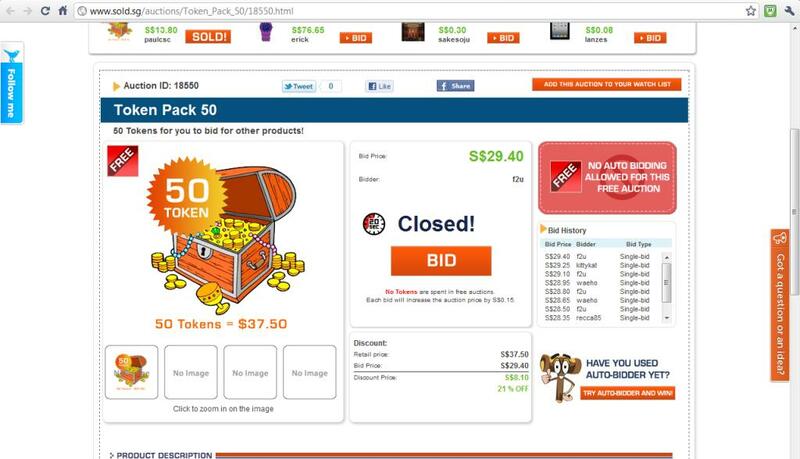 (for iPhones, Android phones...) so that users can bid on the go! On 26th August 2011 (Friday), I received an email notification that the item has been shipped. 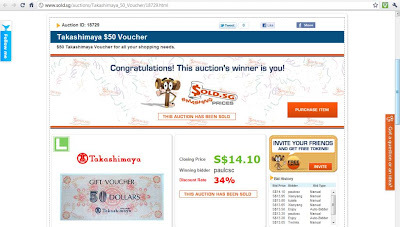 I received the Takashimaya Gift Voucher on 29th Aug 2011 (Monday) by post! Prompt delivery! 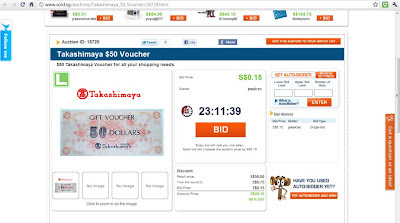 Instead of one $50 voucher, it is 5 X $10 Takashimaya Vouchers! This means I can use it on 5 separate occasions! Apparently it was officially launched around 30 May 2011, according to their "Early Bird Special" promotion. Looks like this kind of business is heating up. - Yeoh, W. T. (2011, October 16). 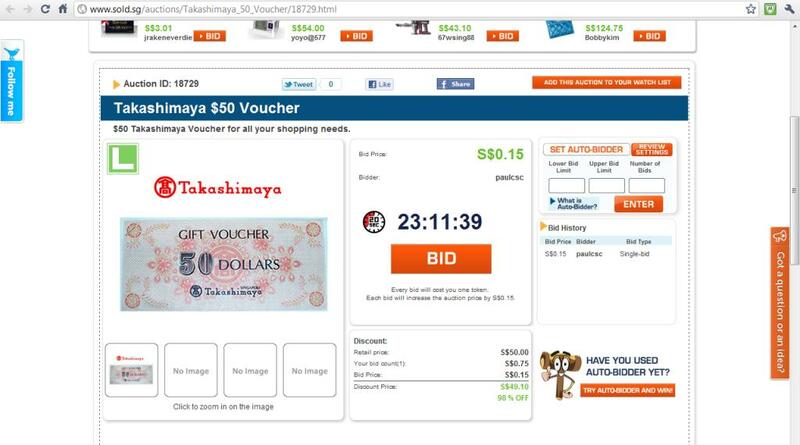 He wins $4,000 watch in online auction. For a limited period, the auction website is donating 46 times the amount of the winning bids of certain auctions to Project Helping Hands, which is the newspaper's charity that helps seniors living alone. The website has promised to donate a minimum of $10,000. was launched on 9th October 2011 by Mr. Lenny Lim, 27, and his sister Merliza, 26. I guess there will be more upcoming competitors in this area. They are privately owned by Analog Entertainment Pte Ltd, based in Singapore (registered in 2010). The Terracotta Warriors Weekend Festival. Terracotta Warriors: The First Emperor and His Legacy. when: went on 14 Aug 2011 (Sun). where: Special Exhibitions Gallery, ACM Empress Place. Exhibition from 24 Jun 2011 to 16 Oct 2011. 1 Year Youth Olympic Games Celebration & Official Launch of Singapore Youth Olympic Festival. where: Singapore Expo Hall 4.
when: 14 August 2011 (Sun). It has been 1 year since the 1st ever Youth Olympic Games was held in Singapore! 14 August 2011 (Sunday) marks the 1st anniversary of the 1st ever Youth Olympic Games! Watch this 3-min highlights video and relive some memories. What was your most memorable Singapore 2010 Youth Olympic Games moments? "Singapore highlights: Get back into the YOG spirit !" uploaded by olympicsingapore2010 on Sep 10, 2010. NDP 2011: Majulah! The Singapore Spirit! Nothing is gonna take away my love for this country. Appreciating all the things that I have experienced so far. Explore and (re)discover Singapore lah! Here's a cool video showing various places in Singapore. Have you been to all the places shown in the video? I've not. There are still places in Singapore waiting for you to explore and discover. "Project RunThruSingapore [Full Video]" uploaded by SteadiProductions on Aug 7, 2011. National Day Museums Open House. - where: National Museum of Singapore, Singapore Art Museum, Asian Civilisations Museum. when: 9 Aug 2011 (Tue). - where: Near Esplanade (Marina Bay). Quick tips on how to shoot photos of fireworks. 2. Position the camera on where you want to capture the shot. 3. Manual focus the shot beforehand. Watch this gorgeous time lapse photography of Singapore and the spectacular NDP fireworks at the end. Excellent accompanying background music! First Cut: Singapore Timelapse and National Day Parade 2011 Fireworks by Repro. NDP (Preview) 2011 - Majulah! The Singapore Spirit. National Day Parade (Preview) 2011 - Majulah! The Singapore Spirit. when: 30 July 2011 (Saturday). where: The Float @ Marina Bay. NDP Quickie: "Slideshow: Click to view The National Day Parade 2011 - in 2 minutes!"